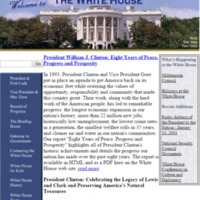 Version 2 is representative of the second major release of the Clinton Administration's White House web site. 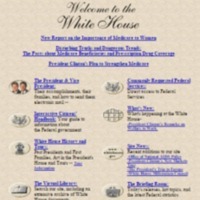 This generation of the White House web site introduced the White House as the “Gateway to Government.” The information contained within this snap shot is as it existed in August of 1999. Version 3 is representative of the Clinton Administration's White House web site as it existed in July of 2000. 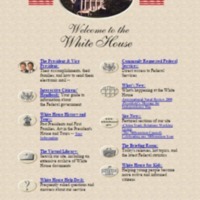 Version 4 provides examples of Audio (July through December, 2000), Video (August through November, 2000) and other online documents (August) as provided for by various features on the White House web site. 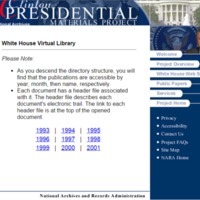 The Clinton Administration's White House Virtual Library provides a searchable archive of White House documents, including Executive Orders, press briefings, radio addresses and other White House publications released between January 20, 1993 through mid-January, 2001. 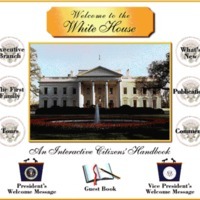 Originally published on the Clinton Administration's White House websites.